This tutorial shows you how to use Azure Notification Hubs to send push notifications to a specific app user on a specific device. 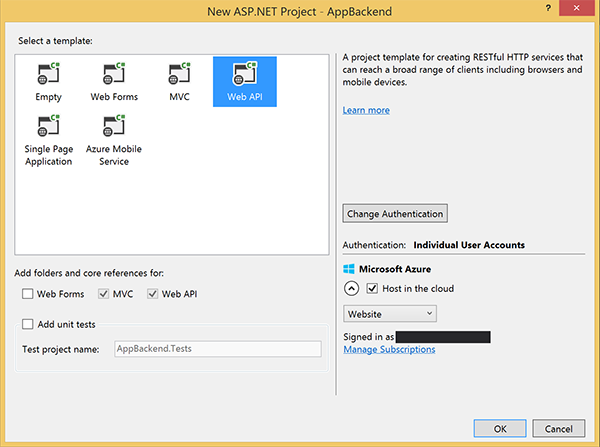 An ASP.NET WebAPI backend is used to authenticate clients. When the backend authenticates a client application user, it automatically adds a tag to the notification registration. The backend uses this tag to send notifications to the specific user. The completed code for this tutorial can be found on GitHub. This tutorial builds on the notification hub and Visual Studio project that you created in the Tutorial: Send notifications to Universal Windows Platform apps by using Azure Notification Hubs tutorial. Therefore, complete it before starting on this tutorial. If you are using Mobile Apps in Azure App Service as your backend service, see the Mobile Apps version of this tutorial. Authenticate clients: You add a message handler to authenticate client requests and associate the user with the request. Register for notifications by using the WebAPI backend: You add a controller to handle new registrations for a client device to receive notifications. The authenticated username is automatically added to the registration as a tag. Send notifications to clients: You add a controller to provide a way for users to trigger a secure push to devices and clients associated with the tag. If you are using Visual Studio 2015 or earlier, before starting this tutorial, ensure that you have installed the latest version of NuGet Package Manager for Visual Studio. To check, start Visual Studio. On the Tools menu, select Extensions and Updates. 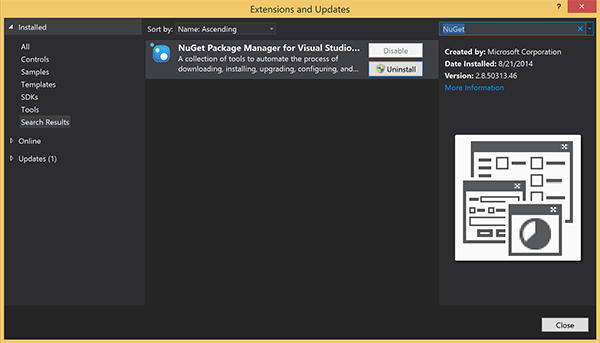 Search for NuGet Package Manager in your version of Visual Studio, and make sure you have the latest version. If your version is not the latest version, uninstall it, and then reinstall the NuGet Package Manager. 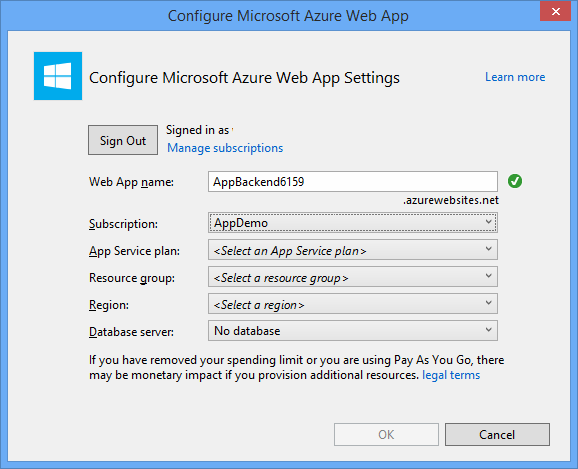 Make sure you have installed the Visual Studio Azure SDK for website deployment. Start Visual Studio or Visual Studio Express. Select Server Explorer, and sign in to your Azure account. To create the web site resources on your account, you must be signed in. 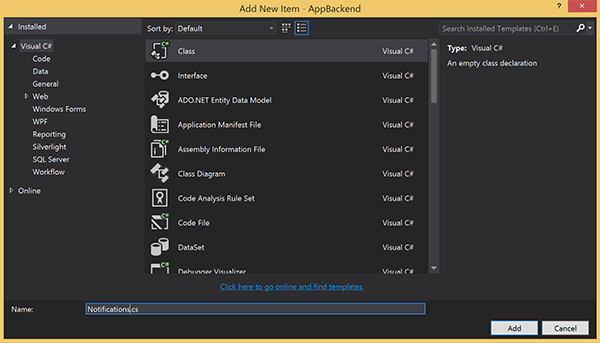 In Visual Studio, right-click Visual Studio solution, point to Add, and click New Project. 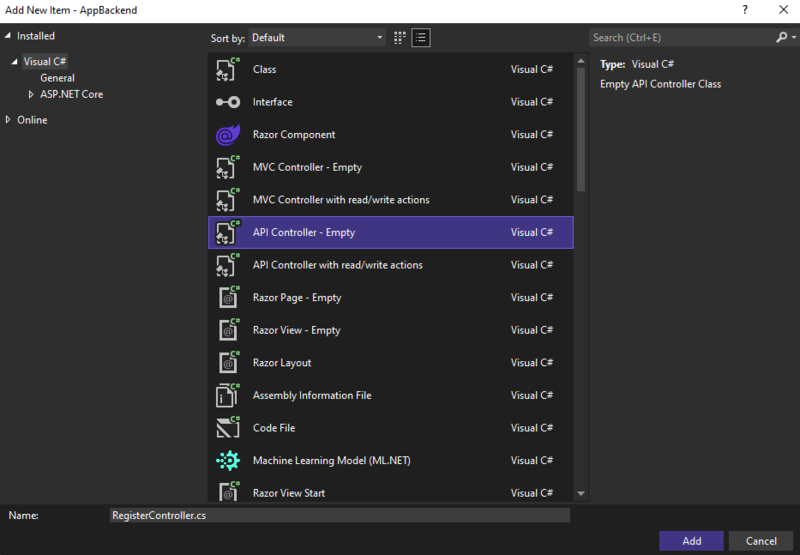 Expand Visual C#, select Web, and click ASP.NET Web Application. In the Name box, type AppBackend, and then select OK. In the New ASP.NET Project window, select the Web API check box, and then select OK. Select an app service plan that you've already created. Select Create a new app service plan, and then create one. You do not need a database for this tutorial. After you have selected your app service plan, select OK to create the project. If you don't see this page for configure app service plan, continue with the tutorial. You can configure it while publishing the app later. In this section, you create a new message-handler class named AuthenticationTestHandler for the new backend. This class is derived from DelegatingHandler and added as a message handler so that it can process all requests that come into the backend. In Solution Explorer, right-click the AppBackend project, select Add, and then select Class. Name the new class AuthenticationTestHandler.cs, and then select Add to generate the class. This class authenticates users by using Basic Authentication for simplicity. Your app can use any authentication scheme. The request includes an Authorization header. The request uses basic authentication. The user name string and the password string are the same string. Otherwise, the request is rejected. This authentication is not a true authentication and authorization approach. It is only a simple example for this tutorial. If the request message is authenticated and authorized by AuthenticationTestHandler, the basic authentication user is attached to the current request on HttpContext. User information in HttpContext will be used by another controller (RegisterController) later to add a tag to the notification registration request. // This is not a real authentication scheme. Security note: The AuthenticationTestHandler class does not provide true authentication. It is used only to mimic basic authentication and is not secure. You must implement a secure authentication mechanism in your production applications and services. In this section, you add a new controller to the WebAPI backend to handle requests to register a user and a device for notifications by using the client library for notification hubs. The controller adds a user tag for the user that was authenticated and attached to HttpContext by AuthenticationTestHandler. The tag has the string format, "username:<actual username>". In Solution Explorer, right-click the AppBackend project and then select Manage NuGet Packages. In the left pane, select Online and then, in the Search box, type Microsoft.Azure.NotificationHubs. In the results list, select Microsoft Azure Notification Hubs, and then select Install. Complete the installation, and then close the NuGet Package Manager window. This action adds a reference to the Azure Notification Hubs SDK by using the Microsoft.Azure.Notification Hubs NuGet package. Create a new class file that represents the connection with the notification hub that's used to send notifications. In Solution Explorer, right-click the Models folder, select Add, and then select Class. Name the new class Notifications.cs, and then select Add to generate the class. Next, create a new controller named RegisterController. In Solution Explorer, right-click the Controllers folder, select Add, and then select Controller. 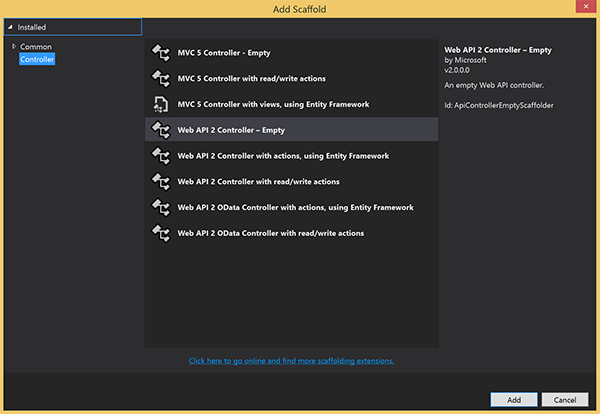 Select Web API 2 Controller - Empty, and then select Add. In the Controller name box, type RegisterController to name the new class, and then select Add. Add the following code inside the RegisterController class definition. In this code, you add a user tag for the user that's attached to HttpContext. The user was authenticated and attached to HttpContext by the message filter that you added, AuthenticationTestHandler. You can also add optional checks to verify that the user has rights to register for the requested tags. In this section, you add a new controller that exposes a way for client devices to send a notification. The notification is based on the username tag that uses Azure Notification Hubs .NET Library in the ASP.NET WebAPI backend. Create another new controller named NotificationsController the same way you created RegisterController in the previous section. This code sends a notification type that's based on the Platform Notification Service (PNS) pns parameter. The value of to_tag is used to set the username tag on the message. This tag must match a username tag of an active notification hub registration. The notification message is pulled from the body of the POST request and formatted for the target PNS. Depending on the PNS that your supported devices use to receive notifications, the notifications are supported by a variety of formats. For example, on Windows devices, you might use a toast notification with WNS that isn't directly supported by another PNS. In such an instance, your backend needs to format the notification into a supported notification for the PNS of devices you plan to support. Then use the appropriate send API on the NotificationHubClient class. To run the application and ensure the accuracy of your work so far, select the F5 key. 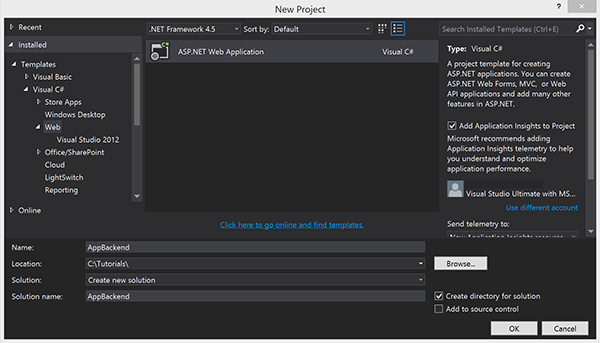 The app opens a web browser, and it is displayed on the ASP.NET home page. Next, you deploy the app to an Azure website to make it accessible from all devices. Right-click the AppBackend project, and then select Publish. 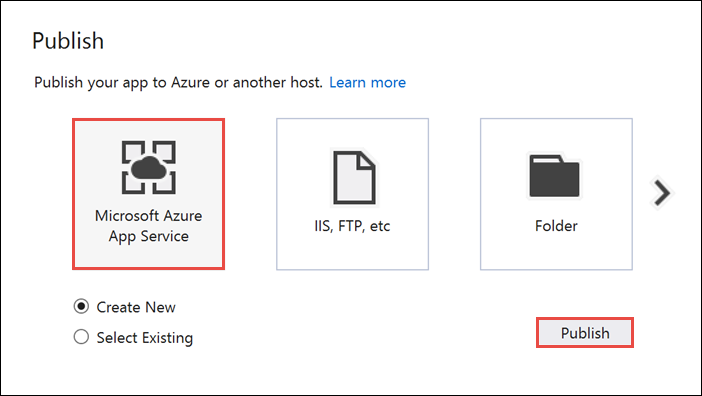 Select Microsoft Azure App Service as your publish target, and then select **Publish. The Create App Service window opens. Here you can create all the necessary Azure resources to run the ASP.NET web app in Azure. In the Create App Service window, select your Azure account. Select Change Type > Web App. Keep the default Web App Name, and then select the Subscription, Resource Group, and App Service Plan. Make a note of the Site URL property in the Summary section. This URL is your back-end endpoint later in the tutorial. After you've completed the wizard, it publishes the ASP.NET web app to Azure and then opens the app in the default browser. Your application is viewable in Azure App Services. The URL uses the web app name that you specified earlier, with the format http://<app_name>.azurewebsites.net. 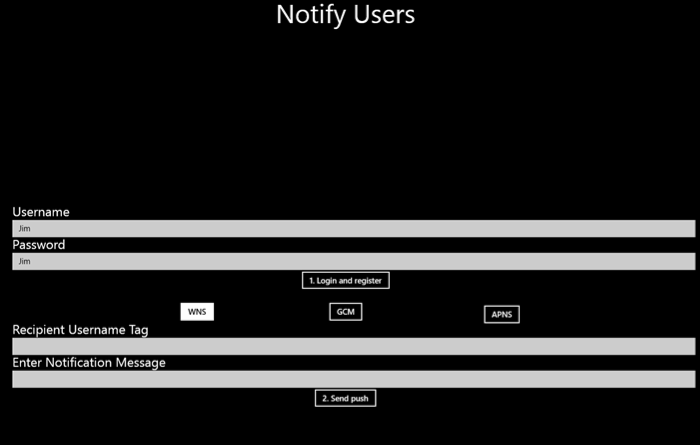 In this section, you update the code in the project you completed for the Tutorial: Send notifications to Universal Windows Platform apps by using Azure Notification Hubs tutorial. The project should already be associated with the Windows store. It also should be configured to use your notification hub. 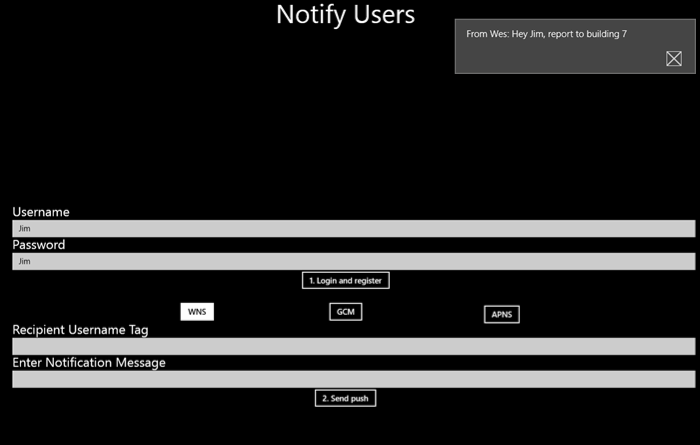 In this section, you add code to call the new WebAPI backend and use it for registering and sending notifications. In Visual Studio, open the solution you created for the Tutorial: Send notifications to Universal Windows Platform apps by using Azure Notification Hubs. In Solution Explorer, right-click the Universal Windows Platform (UWP) project and then click Manage NuGet Packages. On the left-hand side, select Browse. In the Search box, type Http Client. In the results list, click System.Net.Http, and click Install. Complete the installation. Back in the NuGet Search box, type Json.net. Install the Newtonsoft.json package, and then close the NuGet Package Manager window. In Solution Explorer, in the WindowsApp project, double-click MainPage.xaml to open it in the Visual Studio editor. <Button Grid.Row="4" Grid.ColumnSpan="3" HorizontalAlignment="Center" VerticalAlignment="Center"
In MainPage.xaml.cs for the WindowsApp project, add the following member to the MainPage class. Be sure to replace <Enter Your Backend Endpoint> with your actual backend endpoint obtained previously. For example, http://mybackend.azurewebsites.net. Add the code below to the MainPage class in MainPage.xaml.cs for the (Windows 8.1) and (Windows Phone 8.1) projects. The PushClick method is the click handler for the Send Push button. It calls the backend to trigger a notification to all devices with a username tag that matches the to_tag parameter. The notification message is sent as JSON content in the request body. The LoginAndRegisterClick method is the click handler for the Login and register button. It stores the basic authentication token (represents any token your authentication scheme uses) in local storage, then uses RegisterClient to register for notifications using the backend. // The "username:<user name>" tag gets automatically added by the message handler in the backend. // The tag passed here can be whatever other tags you may want to use. // The device handle used is different depending on the device and PNS. // Windows devices use the channel uri as the PNS handle. Open App.xaml.cs and find the call to InitNotificationsAsync() in the OnLaunched() event handler. Comment out or delete the call to InitNotificationsAsync(). The button handler initializes notification registrations. Right-click the WindowsApp project, click Add, and then click Class. Name the class RegisterClient.cs, then click OK to generate the class. This class wraps the REST calls required to contact the app backend, in order to register for push notifications. It also locally stores the registrationIds created by the Notification Hub as detailed in Registering from your app backend. It uses an authorization token stored in local storage when you click the Login and register button. Add the following code inside the RegisterClient class definition. Launch the application on both Windows. Enter a Username and Password as shown in the screen below. It should differ from the user name and password you enter on Windows Phone. Click Log in and register and verify a dialog shows that you have logged in. This code also enables the Send Push button. Then in the Recipient Username Tag field, enter the user name registered. Enter a notification message and click Send Push. Only the devices that have registered with the matching username tag receive the notification message.